Fiat enthusiasts from all over the country are right now on the roads heading towards the 2016 Fiat Freakout. The Fiat FreakOut is the Fiat Club America's national convention and this year is being held near Fiat Chrysler Automobiles headquarters in Auburn Hills, Michigan. 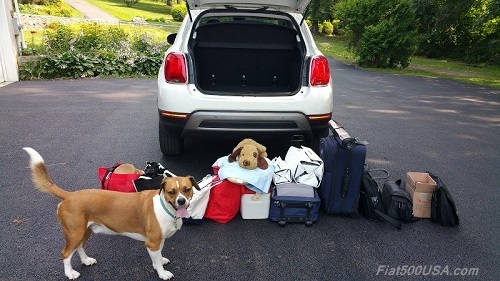 The Fiat FreakOut is something every Fiat owner or enthusiast should attend, so that meant packing up our 500X and driving 650+ miles from our New York base. The Fiat 500X is a great road car so that it would be no sweat. Buddy is on the way to a pet resort to get pampered. For a few dollars more a person could stay at the local Econolodge! Six hours and 400 miles later we're at Niagara Falls, a good waypoint to stop. We haven't visited Niagara Falls in a long time, so we took in the usual sites. Yep, the Falls are still there. It is said to have the highest flow rate of any waterfall in the world, with more than six million cubic feet of water falling over the crest line every minute during high flow time. Along with the Falls, there is the massive over the top entertainment district known for its life-like wax figures, haunted houses and family themed fun aimed at tourists. Everyone should experience Niagara Falls at least once during their lifetime. If the tourist trap thing is too much, Niagara Falls is also the home of numerous award-winning wineries, including The Ice House Winery. Their Gold Medal Winning Icewine is a dessert wine produced from grapes that have been frozen while still on the vine. If you go to the Falls, make sure you treat yourself to a taste. Packing up is the least fun thing about vacation. When you are in Canada, make sure you convert over to kilometers per hour. The fines for speeding in Ontario are steep. We saw a sign that read driving 50 km/h (31 mph) over the speed limit carries a maximum fine of $10,000 and roadside vehicle seizure. Needless to say, we set the cruise control and took it easy. Crossing back into the United States. Make sure you have your papers handy and look up what the NEXUS pre-screened program and the Ready Lane is. That will make getting back into the country a lot quicker. Welcome to Michigan!! Speed limit in Michigan on the highway is 70 mph for cars! Made it to the Freakout's home base at the Auburn Hills Marriott! Let the FreakOut begin!